Reiach and Hall Architects are delighted to have won a British Construction Industry Award for their design of Dundee House, the new civic centre and administrative headquarters for Dundee City Council. The BCI Awards, now in its 25th anniversary year, recognise excellence in its broadest sense – the overall design, construction and delivery of buildings and are highly regarded in the construction sector and the most rigorously judged awards in the industry. The project involved the integration of the grade B listed DC Thomson print hall (1910) into the body of a new building which makes a significant impact on the city and provides a new public one-stop-shop on the ground floor. Galleries and bridges cross the void and provide access into the new build offices, which are organised in three blocks fanning out to the west. With low energy design the focus, incorporating natural and mixed mode ventilation, a rigorours facade was designed to minimise solar gain while maximising the use of natural light throughout the building. The striking and graphic quality of the building’s facade has ensured that it has made a significant impact on the city. Dundee House was built by Lend Lease with engineering consultancy from Buro Happold and cost management by Turner and Townsend. Dundee House is a rich layering of interwoven narratives that attempt to create a building that is a product of its brief yet is firmly grounded in the City of Dundee. The building responds to a very particular site, boldly retaining an historic industrial building while adding an uncompromising contemporary structure. The building meets a demanding operational brief yet creates an inspiring place to work. The building addresses the idea of Civics and the role of serving Dundee’s citizens through an architectural exploration of open public space and through acting as a civic marker in the city. The Dundee Council Offices is a collaboration between the old stone DC Thomson comic printing building with the much larger new administration and public services building. The new building uses the old building as its front door, realising a lofty loggia thereby providing an opportunity for the citizens of Dundee to engage with the building through a new venue for civic life, imagine a coffee shop, a florist, Christmas recitals by primary schools, art events and installations. Inside, the new building has been designed to help the council adopt modern methods of working and provides seven storey of modern sustainable office space. The large floor plates are designed to enable cross discipline working between departments. While at the same time the external and internal light wells allow departmental organisation to form smaller working groups. Breakout areas also animate and enliven the large plans at key points. A great deal of emphasis was placed on material selection and detail. A public building has to last, it has to be durable yet it needs to be attractive and approachable. The selected materials will improve with age from the quite beautiful brick that gives a clue to the site’s industrial past to the finely engineered glazing that has an eye on the future. The drawings and photographs attempt to give a flavour of the design process for Dundee City Council’s new Dundee House headquarters. Illustrations however can only hint at the wealth of creative ideas and processes that were worked through in the development of the building, many discarded, some adopted. It has been a thoroughly imaginative and productive if demanding process that has resulted in a building of great strength and dignity. The photographs of the completed building illustrate the success of a carefully selected material palette. They also show how the design gives the city a building that has presence and gravitas in the townscape without being bombastic or monumental. Ed. This looks to be the best building so far by Reiach and Hall, elegantly restrained but with sufficient presence befitting a city council headquarters. The rationalist exterior with strong articulation and double-height apertures at the top is redolent of Murcia Town Hall by Rafael Moneo, and to a lesser extent also reminds me of Kaufhaus Tyrol, Innsbruck, Austria by David Chipperfield Architects (with less depth in the facade). Reiach and Hall Architects, after winning the competition to design the City of Dundee Council new £27M North Lindsay Street offices, have now submitted this iconic and signature city-centre project for planning approval. Reiach and Hall’s winning scheme for the City Council offers a new marker in the city, fronted by an impressive civic logia, and allows daylight and fresh air to penetrate deep into the plan creating light and airy workspaces. The new City Council offices, located on the site of the former DC Thompson print works, retain, re-use and add to the existing building. The original double height printing press hall is opened up at ground floor to form a dramatic arcaded loggia connecting the ‘’one-stop-shop’’ reception and information area with the new extension of the Overgate Centre Mall. The City Council offices plan allows easy connections between all departments. A proposed decked car park adjacent, imagines a new square for the city, setting off the new City Council building’s role as a civic institution and destination. An A+DS (Architecture + Design Scotland*) design meeting held in Dundee reviewed the City Council project before the planning application was submitted. This new design for Dundee House will help build on the foundations of ‘Changing for the Future’ for improved customer contact. Dundee House will be the new offices for the City Council in North Lindsay Street and will be geared towards providing first-class contact with the public. A new flagship customer centre will be spread over the whole ground floor of the City Council offices, with dedicated staff and facilities to help everyone. People will be able to make a wide range of inquiries about every aspect of the council’s responsibilities. This will cover everything from schools to roads, and from council tax to social work assessments. The aim is to open the City Council offices in about three years’ time to replace Tayside House, which is to be demolished as part of the Central Waterfront development. Dundee House will show the whole city how the council is constantly looking at ways to make it easier for the people of the city to get in touch and to get help. 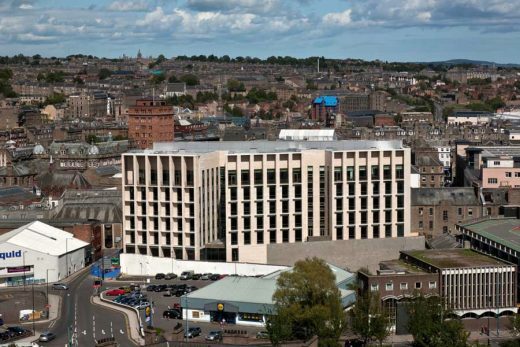 Planning submission for new Dundee City Council £30m headquarters – Dundee House. Construction scheduled to start Spring 2008. To replace 16-storey Tayside House.